A completely different side to Kanye. There is no denying that Kanye West gets a lot of flack in the industry for seeming self-absorbed. We are of the opinion that a little self-love never hurt anyone. 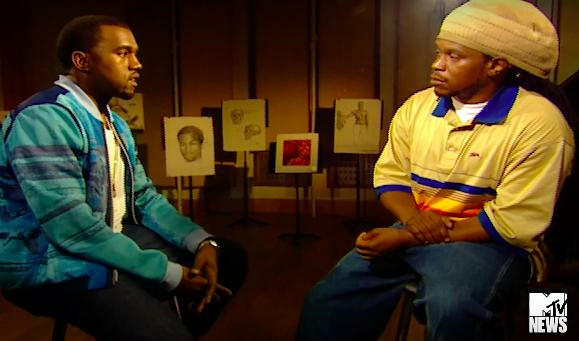 But, as it turns out, Kanye West spent some time in 2005 offering pretty insightful opinions on the blatant homophobia in hip hop and rap music..
A recently unearthed interview with MTV's Sway shows a 28-year old Kanye West openly challenging harmful depictions and stereotypes about gay people and getting seemingly frustrated with his peers. Hip hop is about fighting for your rights, about speaking your mind, and breaking down barriers. But everybody in hip hop discriminates against gay people. [...] I wanted to just come on tv and tell my rappers, and tell my friends: yo stop it, fam. That's really discrimination. To me, that's exactly what they used to do to black people. I'm just trying to say, stop all that. Did Kanye West Just 'Subtweet' Taylor Swift About Her Apple Victory?